Need more information about booking Home 187162 ? Impressive 2 bedroom, 2 bathroom flat conveniently located just minutes from Boscombe pier, beach, new artificial reef and many restaurants, bars and shops. Set within the prestigious Burlington Mansions a former Victorian luxury hotel which has been affectionately restored into luxury apartments, each one being unique with many of the original features retained. The flat, suitable for 4 people was renovated in 2010. It has two entrances and a car park space. The master bedroom has en-suite and there is another separate bathroom. 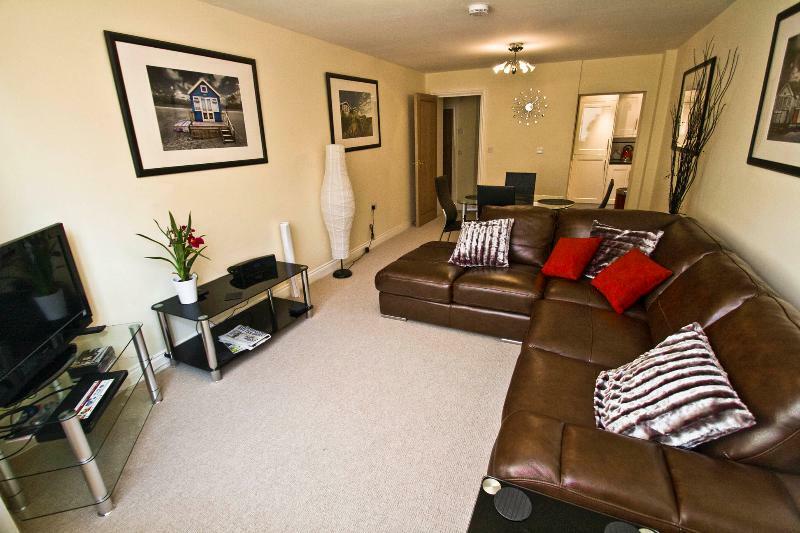 The lounge/dining area is very spacious with a dining table, luxury L shaped sofa and large TV. The kitchen is fully fitted with everything to make this flat perfect for a self-catering holiday. Burlington Mansions is a 5 minute walk to the beach at Boscombe, with Europe’s 1st artificial reef and pier. A good selection of restaurants and bars can be found in several directions within minutes. The centre of Boscombe is 5 minutes walking and Bournemouth centre can be reached by car in 10 minutes. Bournemouth beach is a pleasant stroll along from Boscombe beach or a short ride on the Land Train. • Arrival is after 3pm. Departure before 10am. • Payments accepted by bank transfer or cheque. The apartment is on the ground floor and lower level. There is an outside door on the ground floor which leads into the hallway and the second bedroom. The living room and master bedroom are on the lower level. The living room and bedrooms all have windows and natural light. The interior apartment door goes to the centre of the Burlington Mansions building. Bournemouth has excellent road and rail links to Poole, Southampton and London. Locally there is a good bus network and taxi service. A car is not essential as the beach, shopping and excellent restaurants are all within close proximity. The owner lives an hour from the property and is easily contactable by email or phone. We work very hard to maintain a high standard in the property. We want our visitors to feel comfortable in our apartment ask our guests to respect the property and leave it as they have found it. The concierge at Burlington Mansions is available only for the residents and should only be consulted by holiday guests in the event of an emergency. Please only use the designated parking space that you are given. Please respect the residents and keep noise in the corridors to a minimum. This Apartment has 2 bedrooms, 2 bathrooms and sleeps 4. It’s been listed on Holiday Lettings since 24 Oct 2011. Located in Bournemouth, it has 68 reviews with an overall rating of 5. The average weekly rate varies from £726 to £1071. Excellent apartment, very modern, very clean and comfortable. The location is excellent, beach, shops and restaurants all just a short walk away. Teresa was excellent from booking to arrival, so helpful and lovely to deal with. All first class will be booking again soon. Could not have been happier with my stay at this property. The apartment was very clean and everything was updated and in good working order. Comfortable beds, and well equipped kitchen with everything you need to prepare a meal or coffee. There is also an expansive selection of DVDs to choose from if you want to have a movie night. The AC worked great and kept us comfortable even when it was hot outside. The location is convenient to the beach, restaurants, and shops. All in all, we had a lovely stay and would definitely come back! Stayed at the property for 4 days and we were well pleased with the standard of the flat and its location. It is ideally located for the beach and all the surrounding popular destinations. Would we stay there again - most definitely. The directions and pack supplied by the owner(Teresa) were the best that we have ever received for a holiday.The front of the building stood out in the road.On entering the foyer through the revolving door the words stated from us both was "wow". The apartment is a short easy walk from the foyer down one flight of stairs.The apartment itself was very spacious with excellent quality fixtures and fittings and was very clean on arrival. Every item that was required for the stay was supplied. New sheets were delivered on the first Saturday by a very pleasant lady. There is a door at the rear of the apartment that leads to the car park where the car could be unloaded easily and this also gave easy access to and from the apartment for daily use. The allocated parking spot was of a decent size and could be secured when not in use with a rising bollard. All in all I think it will be very difficult to beat this accommodation. My family stayed at apartment 51 for Easter this year, we had a lovely welcome in the comfortable home from home. Superb location, easy stroll to the beaches & lovely local restaurants. The apartment is very well equipped and everything has thought about, tastefuly decorated too. We look forward to staying here again. This lovely flat was so welcoming when we arrived that it set the mood for the whole of our stay. The place was spotlessly clean and cheerful and furnished to a very high standard. Being only 5 mins walk from the beach was ideal. We really enjoyed the restaurants nearby and it was so nice to go out without taking the car. Although the weather was perfect for the whole of our stay, we would have been happy to remain in the apartment had it rained, it was that comfortable! Super fast Wifi too:-). Can't wait to come back next year! This apartment was full of visually interesting design touches and modern, stylish but comfortable furniture. With a Sainsbury's a few hundred yards from the flat, oven ready meals were easily available and The Reef just round the corner offered great food and an enthusiastic welcome. There are cliff walks that start a few minutes from the door, with stunning views of Hengistbury and the Isle of Wight, and buses to other parts of the area run every few minutes . Booking and payment was achieved in about 10 minutes over the internet and the keys arrived by post the next day, with a stamped addressed envelope for their return. The owner goes out of her way to ensure a happy stay. Altogether this was a much better option than a hotel room. we enjoyed an extremely comfortable and relaxing holiday in this apartment which was very well equipped - more so than any we've stayed in before. It is in a convenient location to visit attractions nearby eg Hengistbury Head (our favourite) where we saw the annual migration of flocks of starlings giving a murmuration display, Bournemouth and Southbourne with miles of walking along the promenade or the beautiful Boscombe Chine gardens where you can enjoy a cream tea or play minigolf. We were lucky that the weather was sunny all week but the apartment is well stocked with books and DVDs for wet days. Boscombe High Street with its restaurants and victorian arcades is a short walk away as is a large Sainsbury supermarket. You can get in touch with Teresa (the owner) through the contact form on this page. Send Teresa (the owner) an email through the contact form on this page. Alternatively, if there’s a phone number on this page, you can call them. How do I contact Teresa (the owner)? If you’ve already booked, go to Manage your holiday booking to view Teresa the owner's contact details or send them a message. Or send Teresa (the owner) an enquiry through the Contact the owner/manager form if you’d like a quote or more info first. When you pay online through the Book your stay form, a booking request is sent to Teresa (the owner). You’ll find out within 24 hours whether they’ve accepted - no money will leave your account before then. You can also request a quote from Teresa (the owner) through the contact form. The owner will email you the total cost for your dates and a link to book and pay online. Use the Book your stay form to pay provisionally online. You can pay by credit/debit card or PayPal. Teresa (the owner) will have 24 hours to accept the booking and no money will leave your account before then. Why can't I call Teresa (the owner) before booking? You’ll need to contact Teresa (the owner) to do this. Send them a message in Manage your holiday booking or through the contact form on this page. You can request to change the dates or number of people on your booking via the Manage your holiday booking page. To change your holiday dates use the Edit booking button. If you need to change the number of guests staying then send Teresa (the owner) a message. If Teresa (the owner) agrees, they’ll send you a revised quote outlining the changes. You can review and accept/decline this from the Manage your holiday booking page. You’ll have 48 hours to take action before the revised quote expires.